I have worked with key words and recently mantra words in order to easier focus on what truly matters to me. During the weekend I realized that what I’m striving for is the concept of Beginner’s Mind. My current three mantra words are open-mindedness, presence (here and now) and gratitude. 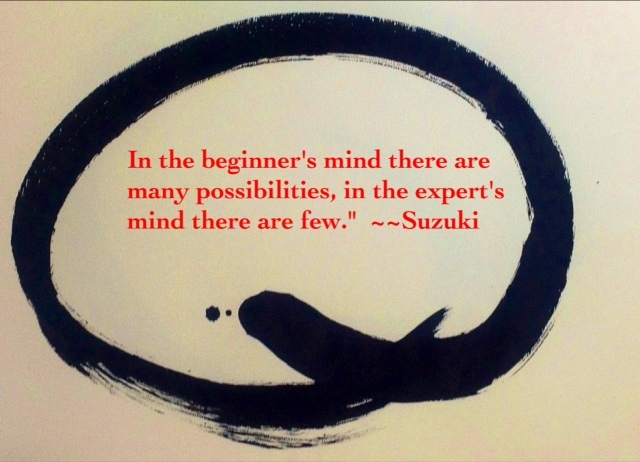 These words can, at least to me, easily be included in the concept of a beginner’s mind. Shoshin is a concept in Zen Buddhism meaning “beginner’s mind”. It refers to having an attitude of openness, eagerness, and lack of preconceptions when studying a subject, even when studying at an advanced level, just as a beginner in that subject would. The term is especially used in the study of Zen Buddhism and Japanese martial arts. Life is not about good answers, it is about interesting questions is a quote by Paulo Coelho that has the same mindset. Now all I have to do is stick to the Beginner’s mind. I’m well aware of that it’s easier said than done. Still, it’s within reach and I’ll do my best. Posted on April 11, 2016 February 23, 2019 by BengtPosted in Discover Your SelfTagged Buddhism, Zen-related.